Breaking down advertising industry jargon, what the above definition describes is that programmatic advertising places ads on the internet in front of the right audience, using patterns in consumer behavior, cookies, and tracking pixels. Chances are any ad you see on a consumer website like Amazon, Kayak, or other major sites are placed there using programmatic advertising. Now that you know what it is, it's important to think about how this could impact recruiting. While there might be some sites that tell you to post in one place and have your job posting distributed across many sites, utilizing this strategy alone begs the question: are your job postings even being seen by the right people? Here again, we see that the 'post-and-pray' model may be threatened, even if the posting is as widespread as can be. I am sure the owners of South of the Border in South Carolina or Wall Drug in South Dakota, who place billboards hundreds of miles ahead of their brick-and-mortar destination would disagree. And surely there is merit to the argument that posting is a basic way to advertise a job posting, so posting in many places may give the biggest reach. Of course, the flip side of that is that you might be getting bad reach. If you need a bank teller but your job posting shows up on a site either (a) out of that bank's market or (b) targeting web developers, then your job posting is not really doing you any favors in drawing applicants. On the other hand, programmatic recruiting might allow you to display your job posting on finance industry sites and geographically relevant sites without the need for you to pick and choose on what sites to post. New technologies can take time to become adopted. Many employers still want applicants to walk through their front door with their resume in hand. Others accept only email attachments. All the while, sophisticated ATS (Applicant Tracking Systems), JAD (Job Ad Distributors), and recruitment advertising technologies exist to make the process of hiring faster and simpler. 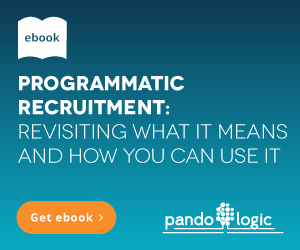 So while this new technology of programmatic recruiting emerges, it may take time for the average recruiter or talent recruiter to adopt it. This is fine, but the company that uses technology to get the best employees are in a better place to succeed. After all, isn't the early bird that gets the worm? Chris Atkins is passionate about making marketing what it should be...a conversation no matter what the medium may be. Now, he turns his skills into valuable education pieces for Talent Acquisition professionals as the world of HR adopts the principals of marketing.